PanARMENIAN.Net - On April 13, Armenian Americans and their allies from across the Greater Washington, DC area rallied in front of the White House to urge President Trump to end U.S. complicity in Turkey’s Armenian Genocide denial by clearly and unequivocally condemning that crime in his annual April 24 commemorative statement. 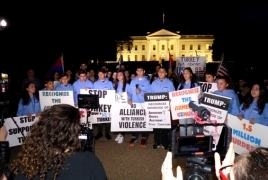 The candlelight vigil was organized by the Washington, DC Armenian Youth Federation “Ani” Chapter, in coordination with a coalition of Armenian American groups, comprising the Armenian Genocide Commemorative Committee of Greater Washington. Two Armenian schools from Southern California - Mesrobian Armenian School and AGBU Manoogian-Demirjian School – participated in the solemn commemoration. This year’s vigil also spotlighted the unprecedented U.S. humanitarian assistance efforts of Near East Relief, a Congressionally mandated campaign which, from 1916-1930, raised the equivalent of over $2.5 billion in today’s currency to assist some 137,000 orphans and over a million Armenian, Greek, Assyrian, Aramean, Chaldean and Syriac survivors of the Genocide. Throughout the program AYF members Aram Najarian, Kristine Antanesian, Sune Hamparian, Mari Tikoyan, and Galy Jackmakjian highlighted the statewide efforts of Alabama, California, Mississippi, New York, and Virginia by outlining specific cases of local organizing and charity work conducted by the American public to aid refugees. Additional states will be honored each year at subsequent vigils.